Turn off the TV, get off the phone and pay attention! Been doing some recent audience research and feel the need to opine. I talked about this in previous posts but not looked in great detail at some of the interactive, cross-media implications of this very current evolutionary trait. Our (newly developed?) ability to take part in simultaneous activities, parallel process or to simply multitask. It has not appeared out of the blue and I will refer below to one project I produced for two-way interactive TV, way back when. It identified a much sidelined but critical part of all service creation today – so read on. But before I go there let’s get up to date – those 25-34 year olds are at it again, this time they lead the multitasker field. In July BIGresearch published a survey entitled “Simultaneous Media” to help producers of media and especially advertisers understand this new’ish trend. There is a feeling by many (me included) that this is less to do with a kind of ‘awakening of consciousness’, bigger brains or faster responsiveness but more to do with just tackling too much choice – and peer pressure (needing to know about more – albeit superficially). Back to a service I created for BBC interactive TV. 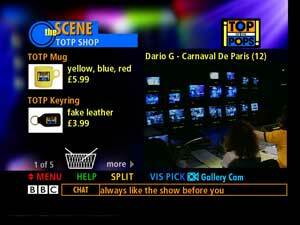 Top of the Pops pilot for Digital Interactive Television. 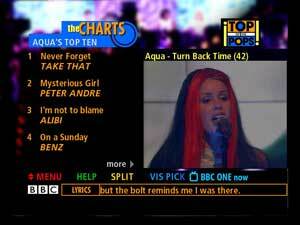 I naturally did quite a bit of digging around into the audience demographics and habits for TOTP and found something even in 1999 that resonates even stronger today – young audiences are using TV as ambient filler media while they do immersive, more communicative things (nothing new there – but it was back then!). A slightly more up to date report from 2003 “How Children Use Media Technology – PDF” states now that the 75% of the 8-17 bracket (my TOTP audience) multitask while watching TV. (Incredibly the same report also said that 43% have visited a web site based on a TV ad or promo in the past week – are you listening advertisers?). Back to TOTP I attempted and succeeded with my service to start the process of meeting the MT’s head-on. If there are large swarms of the population watching TV while browsing the PC in the bedroom, playing with their laptop on the sofa or talking on the mobile between rooms – why not try to bring some of those desired activities onto one screen? If the tech will allow it why not? So…this particular service, some screenshots below, tested extremely well. Young audiences that were able to simultaneous watch four channels of TV at once and answer questions on what they had seen accurately – really got the principle behind this pilot service. live chat, competitions for prizes, an online store, five fun simple, related games, synchronized lyrics, email discussions, chart rundowns, gossip, backstage revelations, tour dates, vote for favourite acts, letters and so on. This was combined with this at least two alternate synchronized streams running parallel to the programme. I designed it so that many of the elements desired by user/s was available. It was possible for a fan for example, to watch just the keyboard player stream, while reading a live chat about him AND taking part in a quiz about his band – all on the same screen, at the same time. Or a more favourite mode was watching (OK ambiently watching) the promo video, streaming some text ‘goss about the show’ and voting for your favourite artist. This is not traditional iTV as it mostly became in the UK (a couple of modes of pre-rendered video or text streams) as you can in effect customize or personalize the viewing format and layout for you – or in edu speak “a user controlled construct”. The very interesting aspect was that in testing it fulfilled two needs. A multi-user need, families would share the screen, the kids would play the game while the parents carried on watching the acts. It also met the demand of the multi-tasker who would go into a three or four way mode – it was easy to set up a chat watch, play a competition and listen/watch the current band for example. We don’t see many of these type of ‘multi-modal’ services yet, probably because they are a nightmare to produce (I know from real experience!) – and one often resorts to doing a single mode, compromised service due to production constraints. Things are changing though and viewers are developing their own single screen composites. Even I watched Live8 recently while doing emails, skyping, typing an article, browsing other parts of the web, playing along with the Floyd (I have a little midi keyboard, yes!) and buying something off eBay – ALL on the same screen – even better when we have clearly defined areas on big screens or 3D layers on small mobile screens. Cross-media therefore can mean hundreds of media-types, available in one place – unless the medium really ‘is’ the message? Looking at the above it suggests a nod towards that often mis-used term ‘convergence’ – many channels of activity onto a multi-modal device, probably a big one at home and also a take anywhere version (keep saying that!). We are now in a world where viewers very quickly recognise that a service is one-dimensional and then fill the void in their physical world with additional dimensions (TV + mobile + web + games + im etc). Producers need to produce services targeted directly at this new, ‘hungry’ for media-bits, audience on single platforms (what the whole Interactive TV vision was about – well mine at least ;). We are moving towards ubiquitous broadband now. Compelling media types spread across platforms may be the start of the journey – perhaps even transitory because that is the environment of change? What lies at the end may be even more compelling cross-media, multi-modal services now technology is catching up. On converged devices, great ideas reinforced by personalized, synchronized, interrelated media choice…let’s hope technical standards, politics and sheer creativity give it another chance. These findings and many more reveal the complex and multi-layered media ecosystem within which we live. Whether at home, at work, in the car or elsewhere, media are almost always with us–often in many forms at the same time. While many of the long-held assumptions about media–such as the centrality of TV–are reinforced, others–such as the belief that younger people are the heaviest users of the web–are called into question. The Middletown Media Studies: The Media Day–as the largest media observation study of its kind–catalogues our daily interactions with media in more detail than ever before. Four Pillars of MyMedia Society Your ruining the game!